DUPERREY -Chefs de L'Isle Taïti. (Isles de la Sociéte) 1. Otouré. 2. Oupaparou. DUPERREY, L.I. - Chefs de L'Isle Taïti. (Isles de la Sociéte) 1. Otouré. 2. Oupaparou. Chefs de L'Isle Taïti. (Isles de la Sociéte) 1. Otouré. 2. Oupaparou. - DUPERREY, L.I. Title : Chefs de L'Isle Taïti. (Isles de la Sociéte) 1. Otouré. 2. Oupaparou..
Map maker : DUPERREY, L.I.. Date : Paris, Arthus Bertrand, 1826. Size : 4.9 x 7.7 inches. / 12.5 x 19.5 cm. 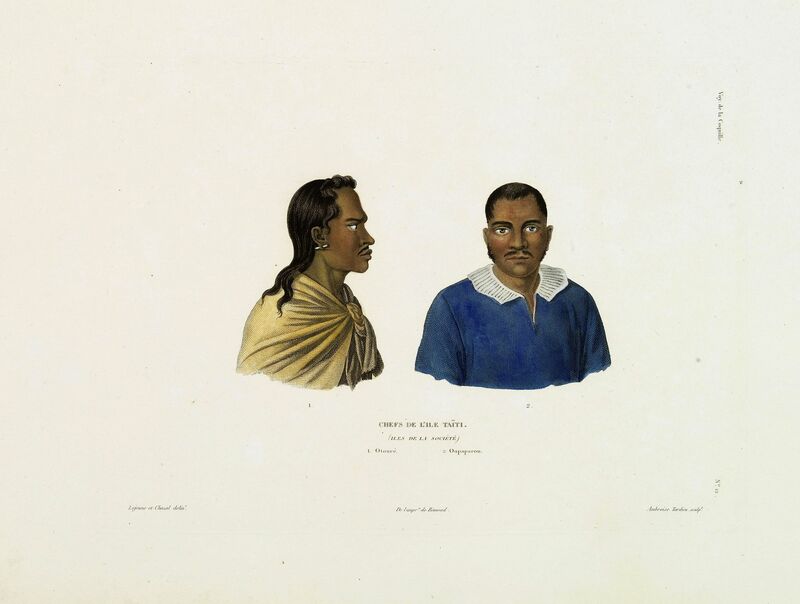 Description :Original hand coloured engraving by Ambroise Tardieu taken from the rare and important book " Voyage autour du Monde, exécuté par ordre du Roi, sur la corvette de sa Majesté, La Coquille pendant les années 1822, 1823, 1824 et 1825. Hydrographie, Atlas." by Louis Isidore Duperrey (1786-1865). The book describes and illustrates the expedition lead by Louis-Isidore Duperrey on the vessel named Coquille. Duperrey had sailed on the "Uranie" with Freycinet, and when he returned in 1820 when he was promoted, he suggested a follow-up voyage, with himself in command ! His proposal was approved, and in 1822 the Coquille set out, with Prosper Garnot as head surgeon and naturalist, and René Primevère Lesson as his assistant. The Coquille sailed in the opposite direction from the Uranie, rounding South America and proceeding west to Tahiti, and then on to the island groups of Melanesia, such as the Solomon Islands. Much time was spent in Papua New Guinea, where many of the animals and plants were new to Europeans. The entire voyage took almost three years. By far the greatest contributions of the expedition were scientific, cartographic, and ethnographic. Recordings were made on Polynesian languages, costumes, weapons and religious artifacts. Duperrey is given credit for discovering the Caroline and Gilbert islands, and for correcting errors in earlier charts of the Society Islands. Duperrey's also continued to explore the French interest in Tahiti and the Society Islands, which culminated in their annexation by France. Condition : Copper engraving in original hand colouring. Size of paper : 310x480mm. Very good condition.